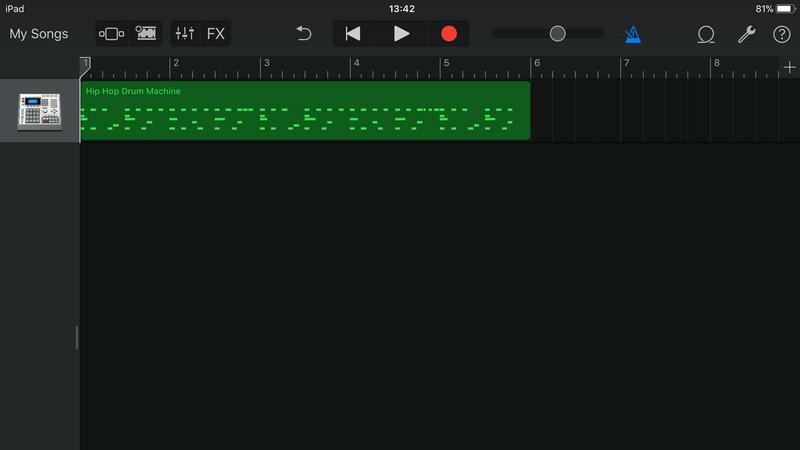 Learn the simple first steps of building a song using GarageBand on your iPhone or iPad. No instruments required! 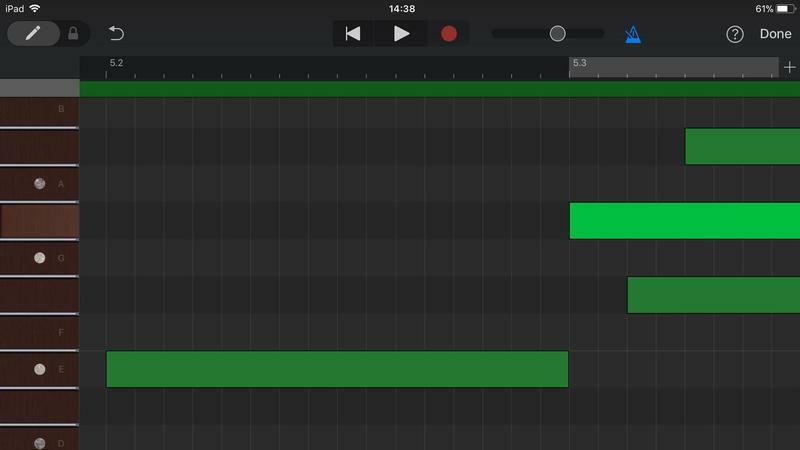 Here’s Sow How to make a song in GarageBand for iPhone & iPad. 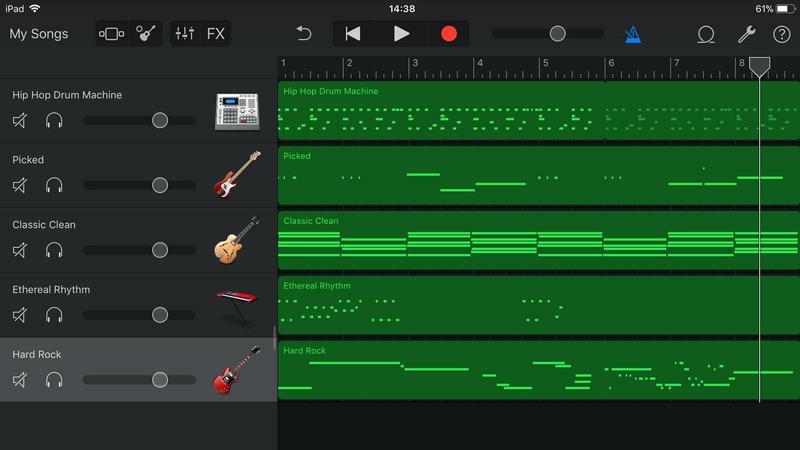 GarageBand is Apple’s audio workstation/music-creation app, allowing users to lay down tracks and create their own musical masterpieces with an array of digital instruments – all from the comfort of their Mac, iPad or iPhone. In this article we focus on the iOS edition of the app. 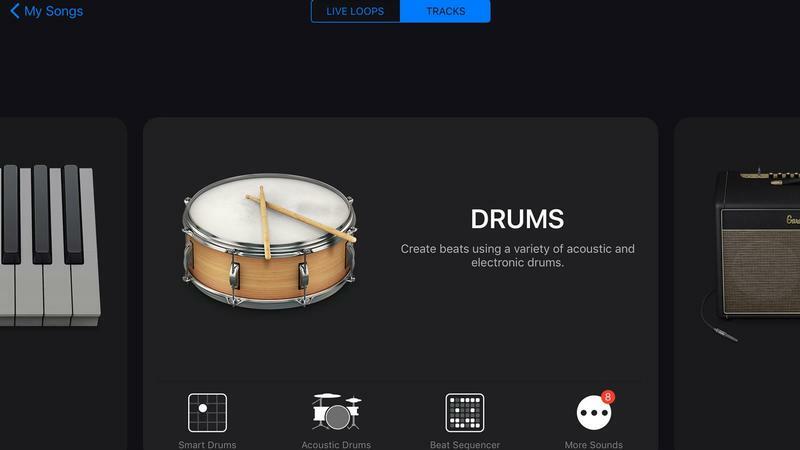 We walk you through the simple first steps of building a song on your iPad or iPhone, creating a drum and bass backing track, layering guitars and piano, experimenting with melodies and finally editing and correcting your riff and balancing the volumes. 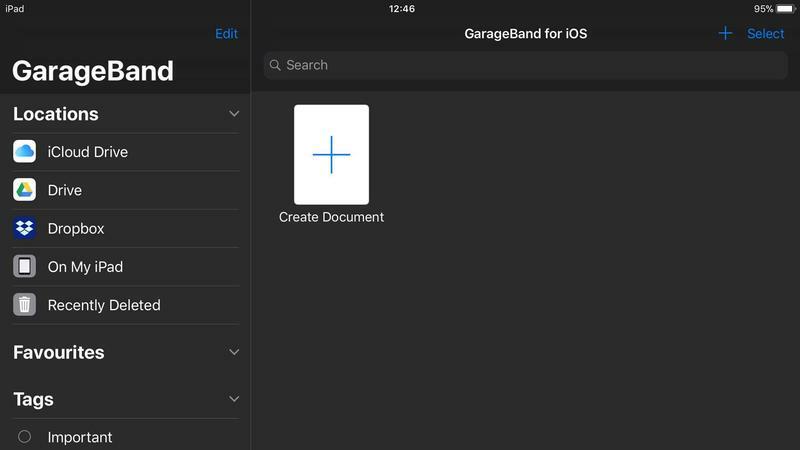 On launching GarageBand you’ll see the option to Create Document. The name might seem a little odd, but in this case document means project. Tap on this and you’ll be able to get going. On the left hand side you’ll also see several locations listed from where you can import your existing GarageBand projects. When starting a new project you can choose between two options at the top of the screen – Live Loops or Tracks. The former is essentially ‘playing’ pre-recorded loops and recording the combinations. It’s fun, but if you want to create something of your own then you’ll want to select Tracks. 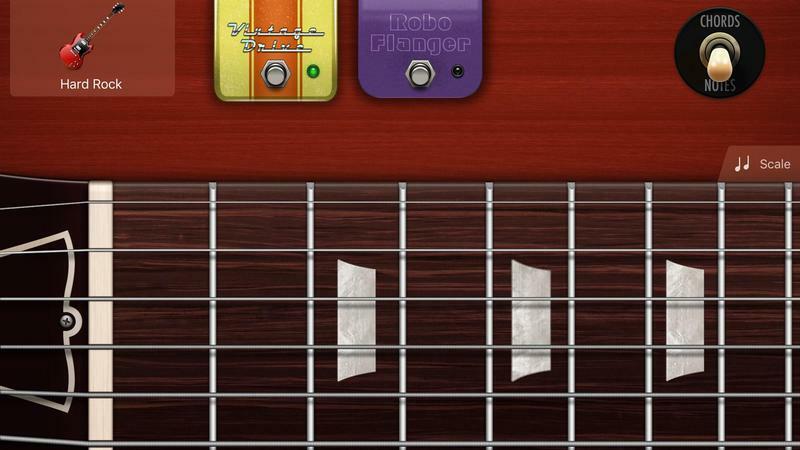 In the main part of the screen you’ll see a selection of instruments you can use, such as Keyboards, Guitars, Strings, Bass, and the new World section. There are also two percussion options – Drums and Drummer. You can use either, but for this project we’ll go down the Drums route as it’s more of a manual approach. There are three modes – Smart, Acoustic, and Beat Sequencer. Again you can use any, but we’ll take Smart Drums this time. On the Smart Drum screen you’ll see a large grid, flanked by various parts of a drum kit. On the left an icon tells you what kit is currently selected; tap this to see what else is available. To create patterns simply tap and drag any of the kit icons on to the grid in either the Loud, Complex, Simple or Quiet sections. Experiment with moving these around. For a random selection you can also tap the Dice icon in the bottom-left corner. Once you’ve settled on a pattern (you can always change it later), it’s time to lay down the first track. 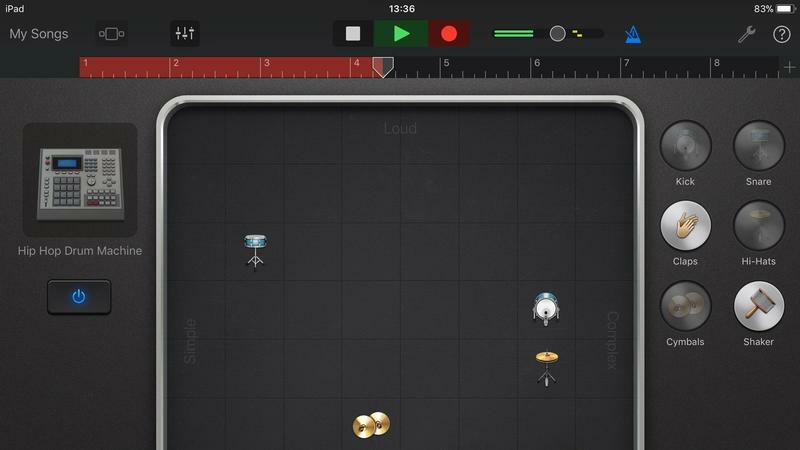 Tap the red Record button at the top of the screen and you’ll hear a four-click intro, then the drums begin to record (press Record again to stop). 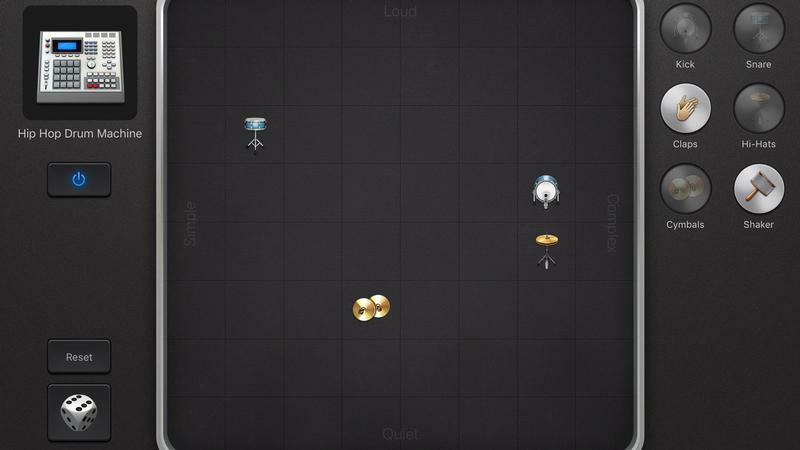 You can adjust the beat in real time by moving the icons on the grid. In the upper left corner of the screen you’ll see three icons. The first is a large square with smaller ones on either side. This lets you select a new instrument. Next to this are three horizontal lines, and tapping this will take you to the project page. The final one is for the track settings. Tap the middle button and you’ll open the Project page. Here you’ll find the drum track at the top. Double-tapping this gives you a few options, including copy or delete. Tap the + sign in the bottom-left corner to move on to the bass. Select Smart Bass from the menu and you’ll be presented with a new control panel. Ensure the rocker switch is set to Chords and you’ll see columns appear with letters donating the chords at the top. Each note in that column will be in the chord, thus making it easier to play riffs without hitting any duffers. There’s also a setting for Autoplay. This will play riffs in the chord of your choosing, which you can change in real-time. 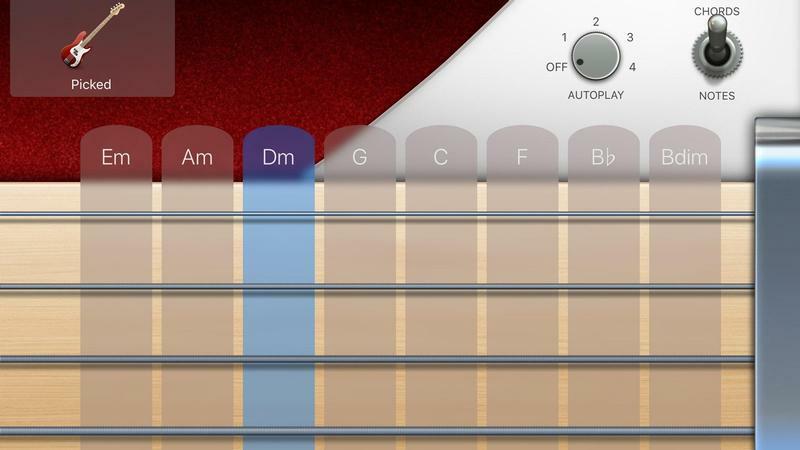 Of course, if you want complete control then switch from Chords to Notes. Press the Play button and jam along with the drums. When you’re happy with the groove it’s time to lay down the track. Again, simply press the Record button, wait for the four-click intro, then play along to the drums. If you make a mistake, stop the track, hit Rewind, then start again. Jotting down the chord sequence will aid you when adding more instruments. Follow the same process to add guitars and pianos. It’s a good idea to add a rhythm guitar track early on to build a bit of body into the song. 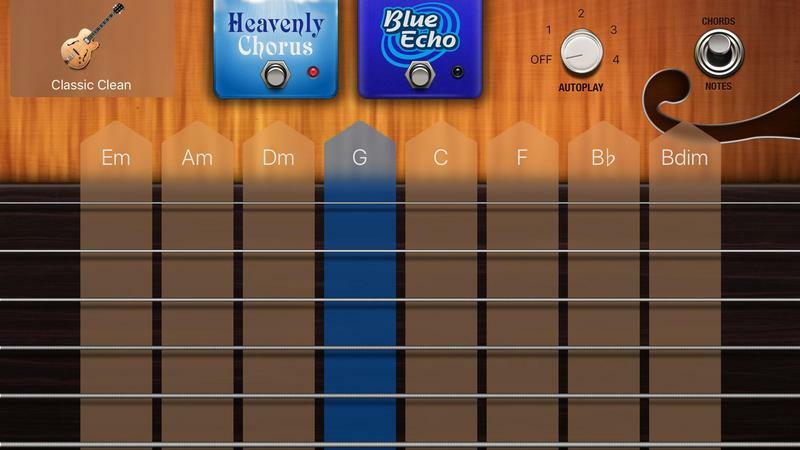 To do this, add a Smart Guitar track, then choose a guitar type. Acoustic is always a solid option, but for livelier compositions you might want an electric. Now you’ll see that you can either strum the chords yourself by sliding your finger down each column, or tap the letter at the top to have it played for you. Again, Autoplay options are also available. With the basic structure of the song in place you can now experiment with adding lead lines and melodies. Select a new instrument, in this case we’ll use an electric guitar as it suits the style of our song, but you can use a piano, synth, strings, or even an Erthu is you prefer. Make sure the selector is switched to Notes and you can now play anything that takes your fancy. Many of the solo instruments allow you to bend the strings, or slide up and down them to create glissando effects. You’re also able to play more than one at a time, which is perfect for giving riffs and melodies a bigger, richer feel. Work out your lines, them tap record and lay them down. Creating riffs is more difficult than using smart patterns, so GarageBand also includes an editor to correct any mistakes or add more complex sequences. Go to the Project page, double-click your riff, then select Edit. The editing screen breaks down the riff into individual notes, displayed as bars. Drag these horizontally to fix timing issues, or vertically to change the note. Slide the Pen icon in the upper left corner to enter the editing mode. Now you can also add new notes by tapping on the main panel. These can be altered in the same way as the existing ones. With a number of tracks now in your project you’ll want to balance their volumes. In the Project page drag out the instrument column on the left. You’ll now see volume sliders for each; adjust these until you’re happy with the balance.